Use alone or alongside larger cabinets for expanded storage when floor space is limited. The standard slimline cabinet is 18-in (457-mm) deep and fits flush alongside a 45-gallon (170-L) cabinet. The deep slimline cabinet is 34-in (864-mm) deep and fits alongside a 60- or 90-gallon (227- or 341-L) cabinet. Both cabinets measure only 23-1/4-in (591-mm) wide. 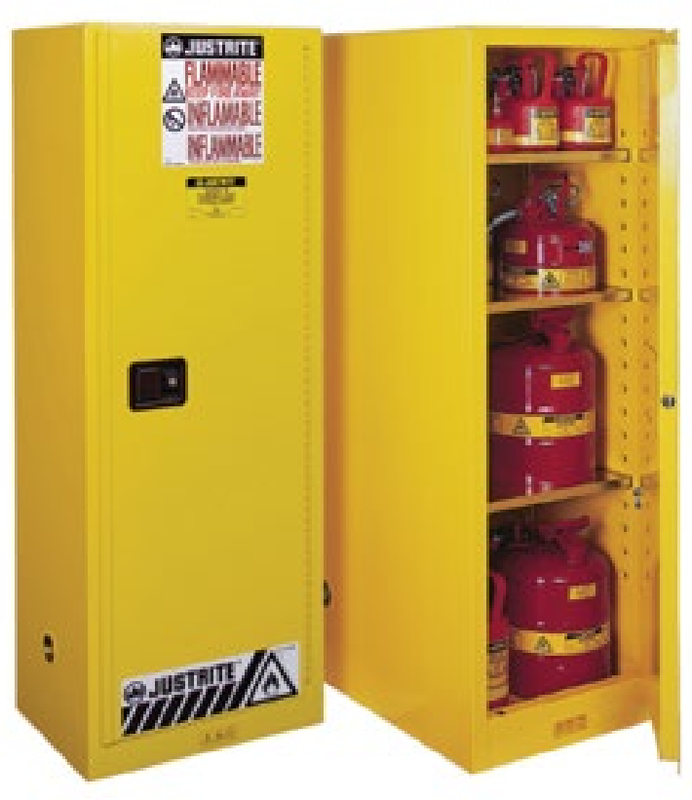 Slim line safety cabinets have all the same features as the larger safety cabinets such as a three-point, self-latching door with self-latching handle, a 2-in (51-mm) leak-proof sump, dual vents, a grounding wire connector and large trilingual warning label identifying contents. Cabinets include three SpillSlope galvanized steel shelves that direct spills to back and bottom into a leak-proof sump.